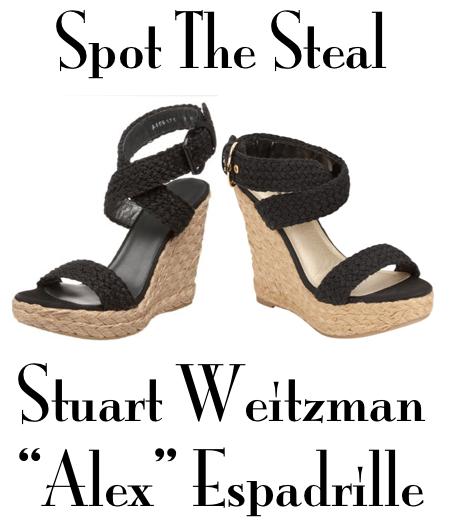 This spring I'm lusting after wedges galore, and these fabulous Stuart Weitzman "Alex" Espadrilles are one of the many I'm head over heels for. Although they're only a mere $365, they're still a tad bit out of my shoe budget price range leaving me looking for an alternate option. As it turns out, we're in luck because I spotted an identical pair at Tilly's for under $30 (Thank you Tilly's)! It's ok to be excited, because I know I am! I've never heard of Tilly's before but it is now added to my list of favorites! What a steal - and nearly identical! :) Great find!